Oh, what a chatty, gabby bunch those George Bernard Shaw characters are in “Major Barbara,” the playwright’s treatise about what salvation really is made of – money and power. The cast of Ethington Theatre’s production of the awfully clever satire, which pits humanitarian, idealist daughter against her straight-up realist munitions manufacturer father, is similarly awfully good at spilling word after word – streams of glorious word after word – of Shaw’s brilliant dialogue. 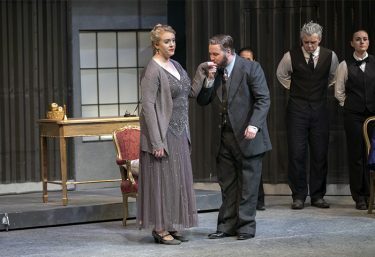 Salvation Army officer Barbara Undershaft (Christine Ward) and her munitions-making, millionaire father, Andrew Undershaft (Cameron Cluff), don’t quite see eye to eye in Ethington Theatre’s production of “Major Barbara,” opening Friday. 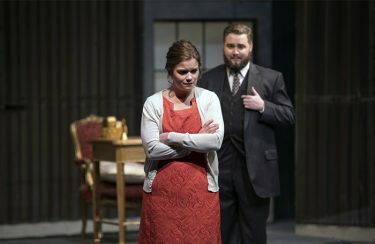 In short, the cast never faltered, not once, in delivering all the dialogue Shaw mercilessly pummels at them at Wednesday’s dress rehearsal, which precedes its 7:30 p.m. opening Friday at Ethington for a two-weekend run. But oh did they deliver the monologues, the peppering of character speeches, the quips and all without one misstep. Director Michael Kary said the cast’s big challenge was to memorize and deliver so much dialogue, and they exceeded that challenge. Add to that a hands-down, atomic bomb shelter-chic, industrial set that included torpedoes hanging from the ceiling as lighting fixtures, wheeled torpedo benches, New York warehouse loft-type sliding doors and a line of red bulbous lights a la underground nuclear facility. 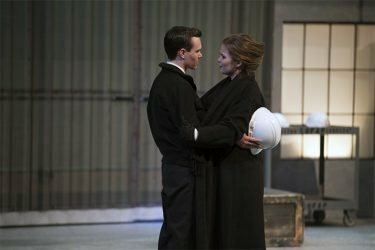 Kudos to scenic designer William Symington and also to lighting designer Claude Pensis, who transforms the stage from the warm glow of the Undershaft home to the bright white light of the family’s weapons facility. And top it off with some spot-on performances by actors unabashed in tackling so many dialects. Lady Britomart (Emily Sheppard) has been estranged from her millionaire husband Andrew Undershaft for some time. For those unfamiliar with “Major Barbara,” the play follows the arrival of millionaire weapons maker Andrew Undershaft (Cameron Cluff) to the home of his estranged family, including wife Lady Britomart (Emily Sheppard), sniveling son Stephen (Ryan Ardelt), daughter Barbara (Christine Ward) and fiance Adolphus Cusins (Brandon Brown), and daughter Sarah (Halee Conway) and her fiancé, Charles (Isaac Bills). Undershaft makes a deal with Barbara. He will go with her to the Salvation Army, where she’s an officer; in exchange, she will visit his munitions factory. Barbara wants to do good deeds and save souls and thinks she can do it at the Salvation Army. But when her father arrives, he conveys his thoughts on the matter: that you can do more good and can help make a dent in poverty, not through good deeds, prayers and faith, but through wealth and power. He says it is wealth that builds churches and keeps organizations such as the Salvation Army going. Barbara is in a pickle when her father offers to donate a large amount of money to the Salvation Army. She refuses to take the donation, knowing that his wealth is tied to war. But will she come to accept her father’s worldview: that money, dirty or not, will do the most good? 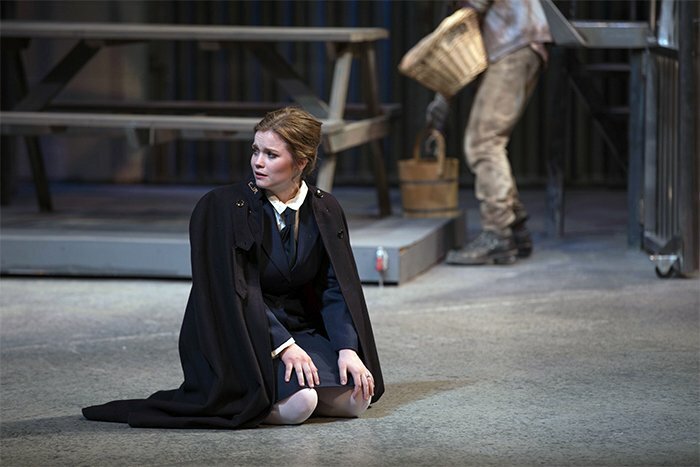 Shaw also presents a unique twist in this play. Undershaft is a foundling who was adopted by his father, also named Andrew Undershaft. It has become a tradition in the family for all of the patriarchs to be foundlings and to adopt the same name. Professor of Greek Adolphus Cusins (Brandon Brown) joined the Salvation Army to be closer to Barbara. Cluff, as arms maker millionaire Andrew Undershaft, sashays onto the stage, his confidence and eloquence at nth-degree levels. You feel his character’s superiority in the way he walks and kind of curls and moves about the stage. But it’s toward the end of the play, when his character puts away his aristocratic niceties and unleashes this verbal storm, railing about how he grew up in poverty, that Cluff really shines. He digs deep with this rumble and insistence in his voice. Ward, who plays his favorite daughter, title character Barbara Undershaft, exhibits a self-assured grace and take-command attitude that befits her character, though Ward leaves room for her character to exhibit even more power. Still, her grace makes for a strong contrast against Andrew Undershaft. When it comes to ultimate uppitiness, you can’t fail with Sheppard’s Lady Britomart and the Undershafts’ only son, Stephen. Sheppard as Lady Britomart torpedoes her dialogue at the audience, talking so fast it’s hard to keep up, and she imbues her character with that proper, put-upon demeanor, while the audience feels Stephen’s whiny, better-than-thou priggishness, thanks to Ardelt, in something as simple as how he holds his teacup and his lippy expressions. Caleb Raney, as the violent, hard-to-redeem Bill Walker, just sneers his way through the production, holding his body in this crooked kind of way that brings Walker to life on the stage. Brandon Brown fits as Greek professor Adolphus Cusins, easily conveying the character’s learned, nose-in-the-books intellectual, idealistic side. 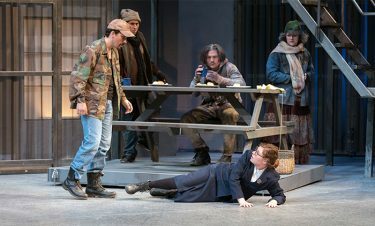 Beyond the sharp, funny performances and witty lines, Ethington’s production of “Major Barbara” steps it up with the costuming, under the helm of costume designer Nola Yergen. While the play is set in the early 1900s, the characters wear dress that’s updated enough to seem contemporary, such as 1940s-ish type suits and skirt suits. Then there’s a scene of characters dancing with missiles in their hands that really captured the humor of this production. The only wobble at Wednesday night’s rehearsal was that some characters’ Cockney accents would slip now and again, and then there were the usual near opening night hiccups, such as safety hats falling off characters and a “fire” prop that didn’t fire down when it was supposed to. Otherwise, be brilliant yourself and see one of the shows at 7:30 p.m. Friday and Saturday, 2 p.m. Sunday, 7:30 p.m. Feb. 16-17 and 2 p.m. Feb. 18. Also starring in “Major Barbara” are Osama Awadalla as Snobby Price, Megan Sutton as Rummy Mitchens, Trustin Adams as Peter Shirley, Camryn McCullers as Jenny Hill, Mandy Tompkins as Mrs. Baines, Christina McSheffrey as Bilton, and John Wilson as Morrison.